Nihon kenkyū is a scholarly Japanese-language journal published twice a year by the International Research Center for Japanese Studies. All manuscripts that contribute to the advancement of research on Japanese culture will be considered for publication. Manuscripts submitted will be refereed before publication. 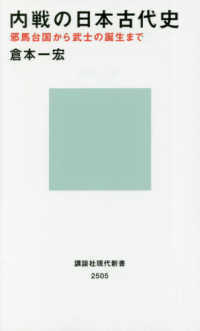 Japan Review is the refereed journal published by the International Research Center for Japanese Studies. Japan Review solicits outstanding manuscripts relating to Japan. It also publishes shorter research notes, review articles as well as annotated translations of important texts. The Kaigai Nihon-zō Shūsei [Images of Japan in Non-Japanese Sources] brings together illustrations from travel journals and scholarly studies by non-Japanese written in the period from the late Tokugawa to the early Meiji era. The “Ihojin-no-Manazashi” [Japan As Seen from Abroad] series brings together illustrations from works in Japanese studies in non-Japanese languages published from the 1850s to around 1900. To promote the understanding of Japanese culture overseas, Nichibunken Translation and Publication Support Project has been supporting the translation (and re-translation) of classics and modern classics written in Japanese and publication in other languages. These indices catalogue the library collections of the International Research Center for Japanese Studies. The Nichibunken Japanese Studies Series contains original research findings, compilations of important manuscripts, and other individual or team research coming out of the International Research Center for Japanese Studies. The Nichibunken Monograph Series, authored primarily by faculty members of the International Research Center for Japanese Studies, presents some of the Center's leading research in English. Nichibunken has been the Center's Japanese-language public relations periodical since 1988. Published twice annually, it contains essays, reports of research activities and research cooperation, updates on team research projects, and other news and information from faculty and visiting faculty members. NICHIBUNKEN NEWSLETTER was first published in 1988 as the Center's English-language newsletter. With essays by researchers relating to Nichibunken, as well as information on programs and outreach activities, this publication is distributed to Japanese studies institutions around the world. Team Research Reports record the research findings of the Center's Team Research Projects. International Symposium (Proceedings) record the presentations and discussions held at International Research Symposiums organized by the International Research Center for Japanese Studies. Overseas Symposium Proceedings are compilations of papers of the Overseas Symposiums organized by the International Research Center for Japanese Studies. Japanese Studies around the World is published intermittently and contains information on Japanese studies research being conducted outside of Japan. Nichibunken Forum Reports record proceedings of the Nichibunken Forum, a monthly lecture/discussion program on a Japanese studies theme given in Japanese by a visiting scholar from overseas. Submission Guidelines for "Japan Review"